et bien au moins vous connaissez mes achats pour 2011 !!!!!! 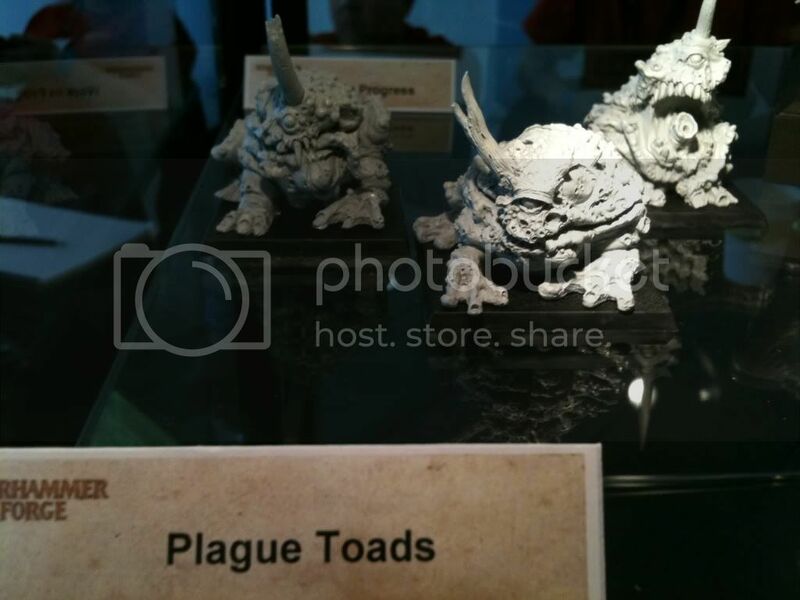 Je me disais aussi, des figs dont le nom contient "Nurgle" ou "Plague", qui ça peut intéresser ? 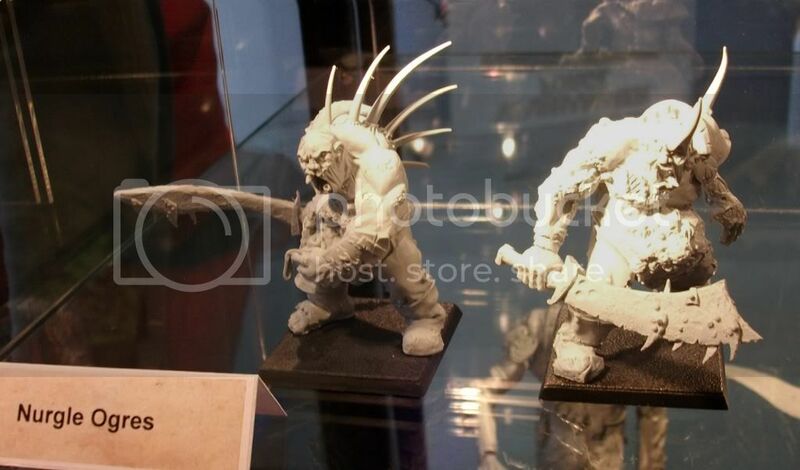 HOOoo, qu'ils sont meugnons les crapaux de nurgle !!! 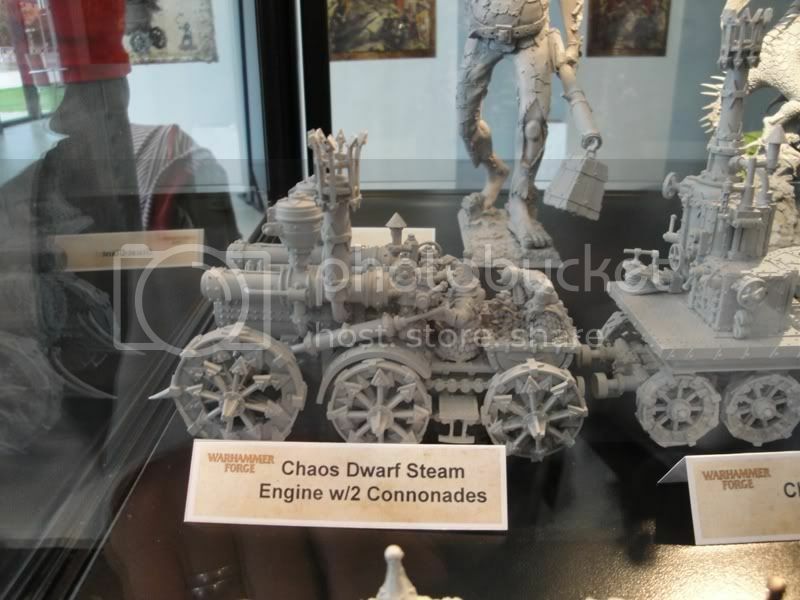 Les machineries des nains du chaos sont sympa mais sont pour les nains du chaos alors c'est pas cool, j'espère que forge sortira des kits pour les gentils nains. Le gros lézard fera un bon gros squig de guerre ! Hâte de voir toutes les armées servies en résine ! 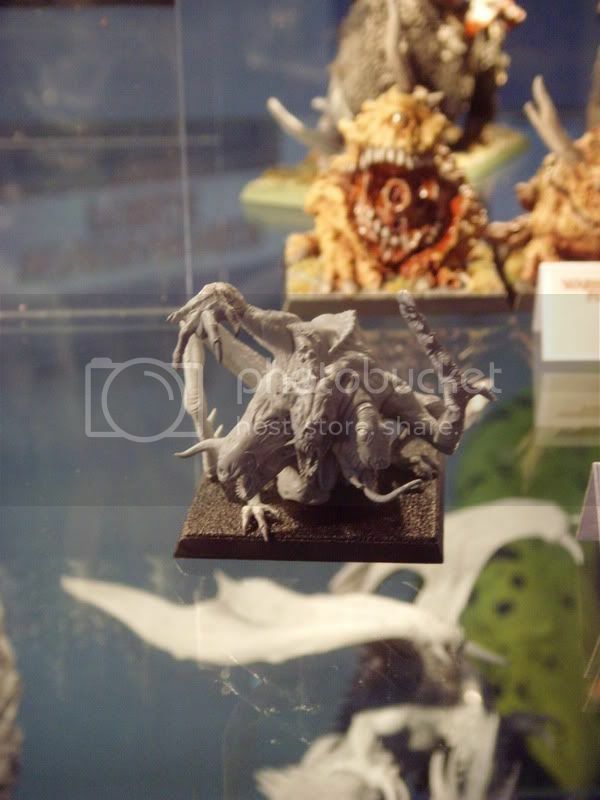 on voit un début de couverture avec ..NURGLE !! ( le trone deTAMURKHAN ) yes !! et un wip de bateau sur roue !!!! ENFIN une armée dédiée à mon dieu fétiche !! 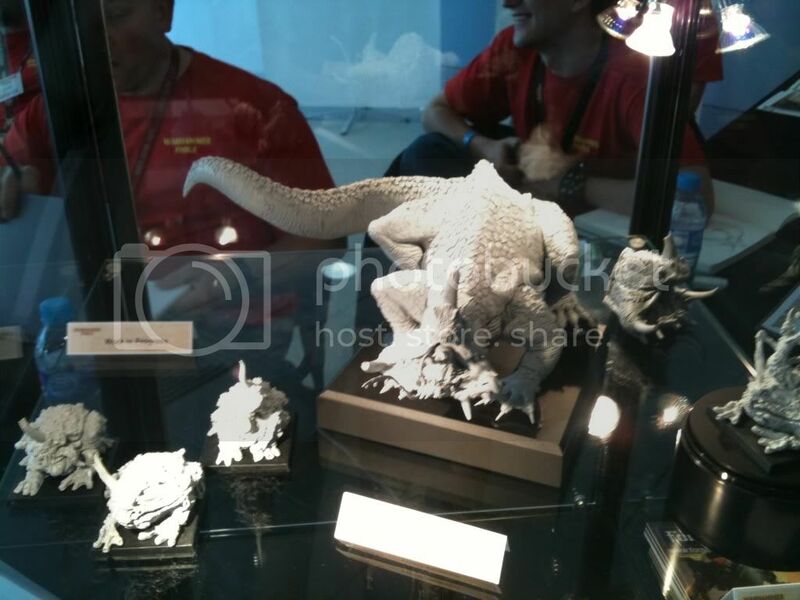 il me manquait déjà le mammouth et le dragon du chaos ! et quelle couverture !!!!!! vivement le poster ! et Benoît qui me disait hier qu'il y avait pas de kit nurgle pour battle. la meilleure nouvelle de la journée. Ce qui fait pas mal de références pour ma pomme !!! vite vite vite je peint mes khemri car la tempête Nurgle approche.... je penses que je vair revoir mes régiments actuels dès cet après midi tiens !!! Ça pourrait être mon choix des armes 2012 ou 2013 (ou 2014, je sais plus... ) ! 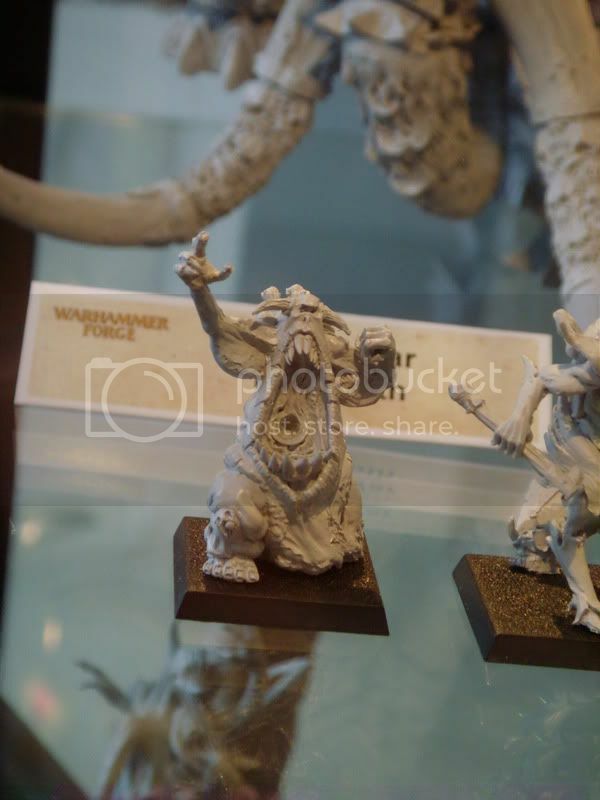 Quand forge se rend compte que du Nurgle se vend très bien à 40k alors pourquoi pas à battle !? Franchement tant mieux, les kits sont vraiment beaux. 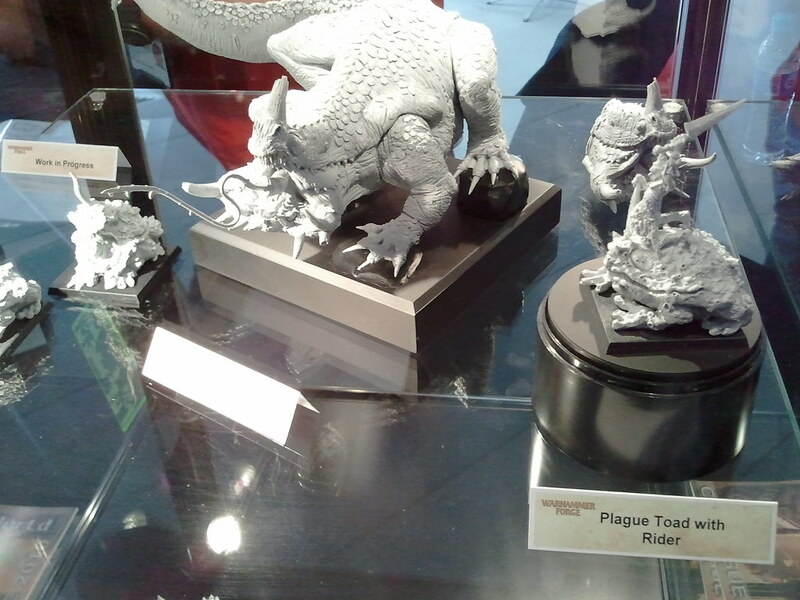 Moi qui pensais à un chouette squig et s'est finalement un lézard pourrie, domage pour les orks. Le poster claque sévère en effet. 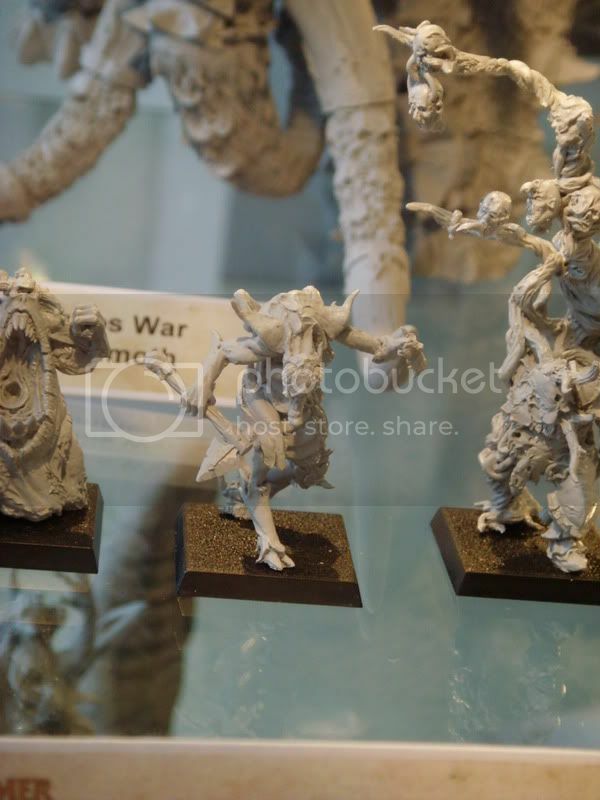 Tu compte te lancer dans une armée chaos/Nurgle pour battle ou utiliser les kits en counts as pour 40k ? 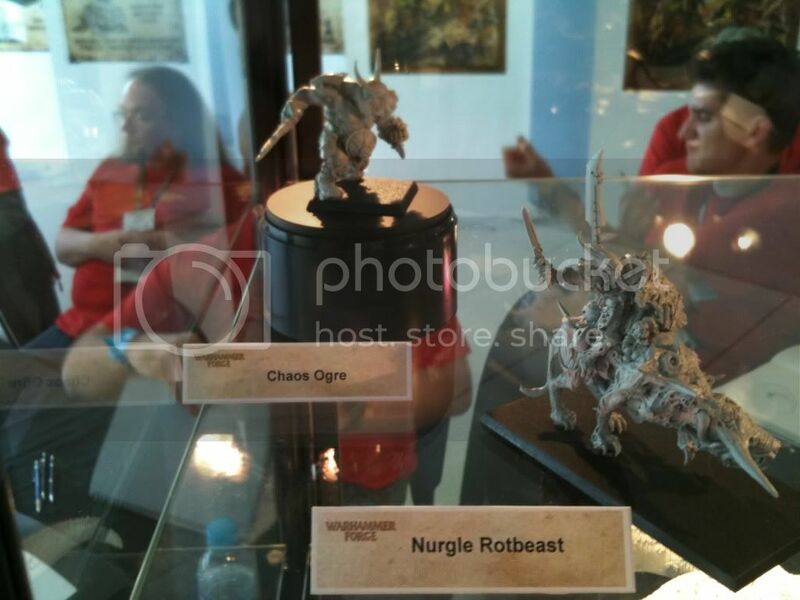 j'ai des figurines chaos à battle convertis ou typés nurgle et j'attends depuis de nombreuses années des figurines dédiées !! les voilà donc je ne peut que craquer et bien entendu certaines serviront de count as à 40K !! ces sorties éclipsent pour moi les eldars noirs ! d'autres photos où l'on voit mieux certains kits ! Je trouve que le dragon est vraiment très classe contrairement à ceux de games pour les hauts elfes. D'après Rick Priestley (l'auteur), les 4 premiers tomes concerneront "l'histoire de comment le Chaos a détruit le monde"... Tout un programme ! 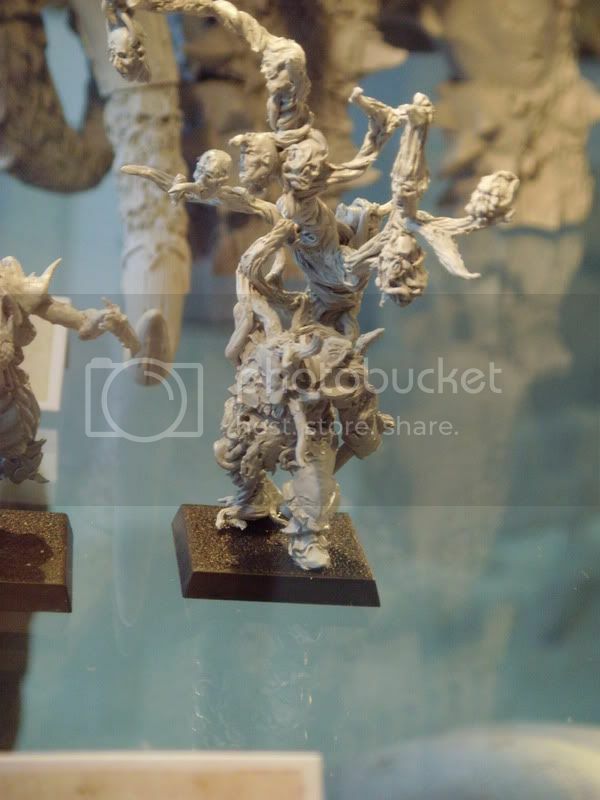 Celui-là vu sa tête, c'est un pote à Nurgle! mais il est monté sur quoi??? 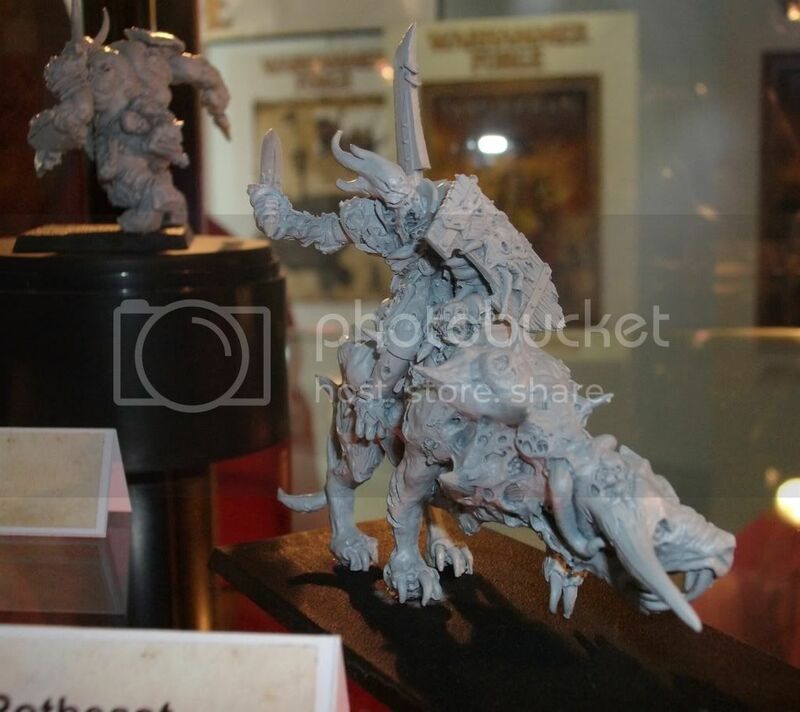 Il se pourrait bien que ce soit le chef des armées de Pesteux dans le bouquin à venir : un tyran ogre de Nurgle. Il faut qu'ils sortent au plus tôt !!!!! JE PARLAIS DU LIVRE !!!! veux peindre veux peindre veux peindre !!!!!! Pareil, ça donne envie ! D'après ce que j'en ai lu sur Warseer, ça donnerait un truc du genre : Chronologie alternative à ce qu'il se fait maintenant car, à la fin des bouquins, le Chaos détruit non seulement l'Empire (apparemment, l'Empereur mourrait ainsi que la quasi totalité des comptes électeurs...) mais tout le vieux monde ! Slaanesh et les elfes noirs contre les hauts elfes.....................mmh un autre rêve qui deviendra peut être réalité ! La couverture me laisse sans voie et me rappelle celle du Realm of chaos ! elle correspond bien à mon idée du chaos monothéiste : on embauche tout le monde: des guerriers, des démons, des hommes b^tes, des monstres, des nains du chaos, des ogres ... pourquoi pas des ogres du chaos sur Rhinox ? va être sympa cette année 2011 mais pas de sortie avant avril 2011 ce serait sympa pour mes White Scars !! les anciens nains du chaos avaient un charme mais outre leur prix actuel ils manquent de finesse de gravure !! il y a aussi les nains moscal de scibor qui sont fantastiques eux !!! I have done a full summary of everything I'm aware of (credit to all those who posted). The launch was originally intended for 2012 but the company want to start seeing a return on the investment in design so they will likely launch in early 2011 with 6-8 pieces and then a second wave to follow shortly after. 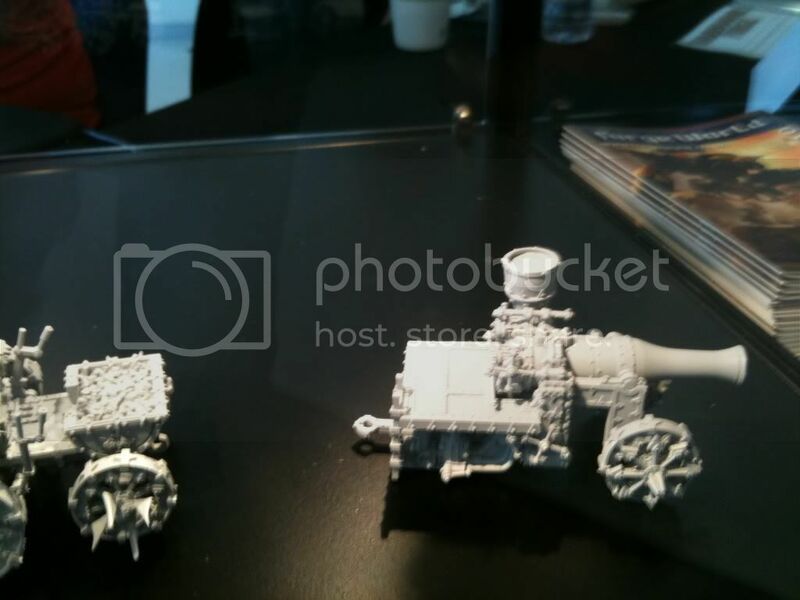 The production cycle is around 3 months and starting in November so around February release, Paul Rudge said that the books are being produced through Forgeworld and that there was one more IA book to come then this then another IA book then a slot which was undecided which could be the second of these. 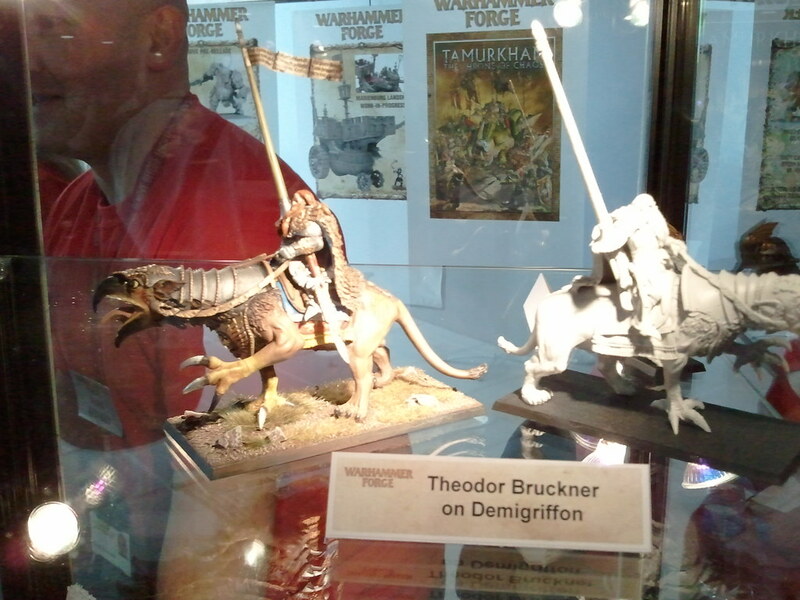 Tamur Khan a nurgle ogre ( possibly a human) riding the toad dragon. 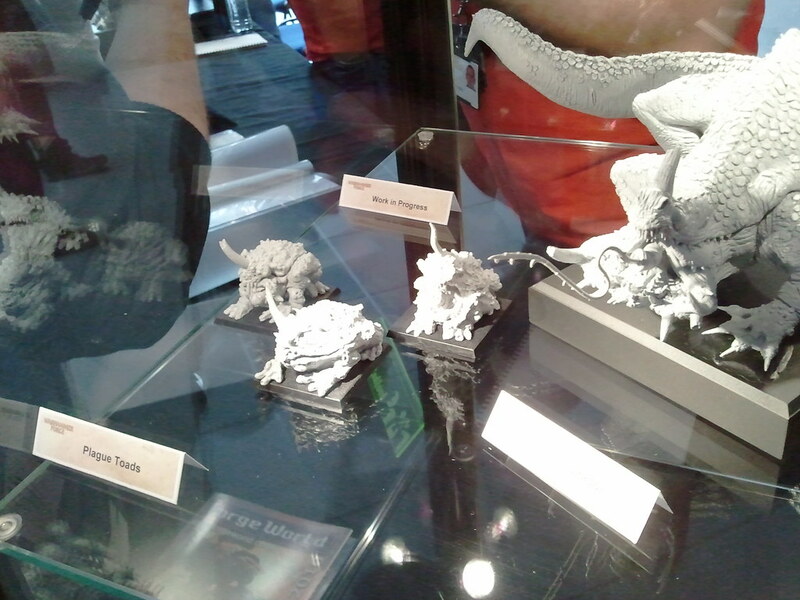 Empire upgrade sprues on display won’t be produced (the fits weren't tight enough) but they will likely re-work them and then release. A BIG land ship ... big enough to have a house on it!. 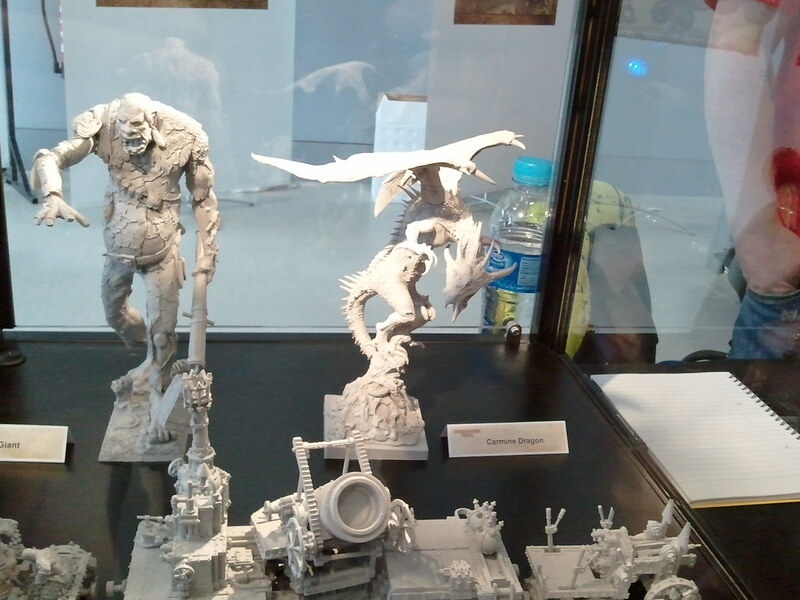 Plastic monsters for next year! 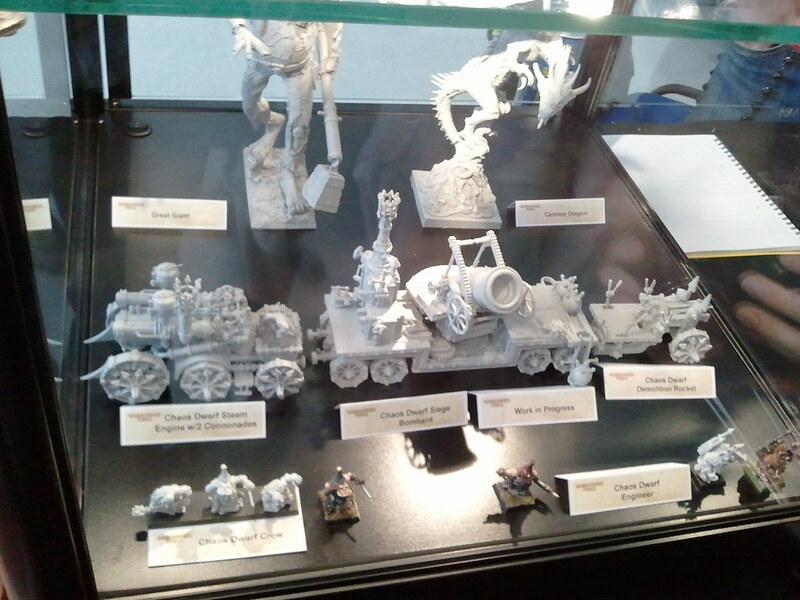 One of the land train carriages will be a platform for a regiment of CD blunderbussers and they will be released separately followed later on by command models. A boat-like flying ship, with wing-oars. 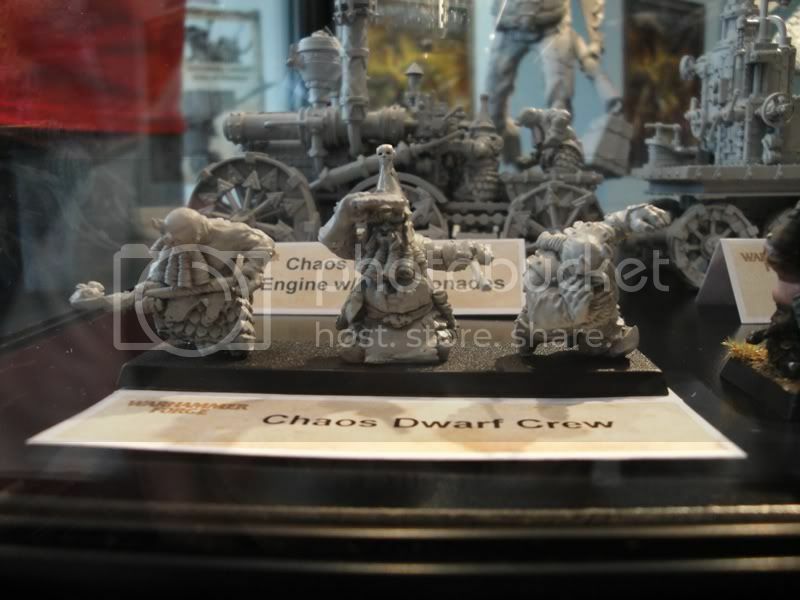 Most of the Chaos Dwarf stuff will be split between books 1-2 as the models have either just been started or are still in the concept phase. Rick confirmed they were not planning to release CD as a complete army. 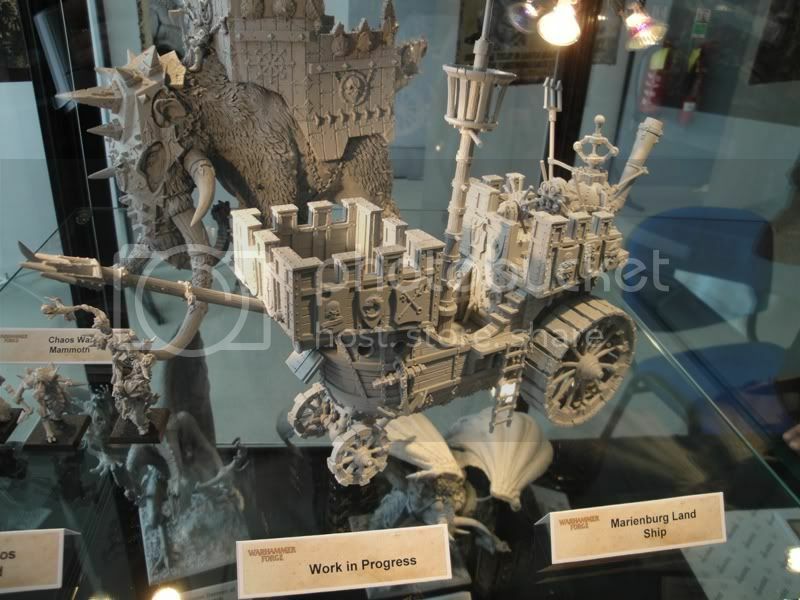 The artillery train was described as akin to the warhammer equivalent of a nuke which would fire up over the walls into the centre of the city and level it! 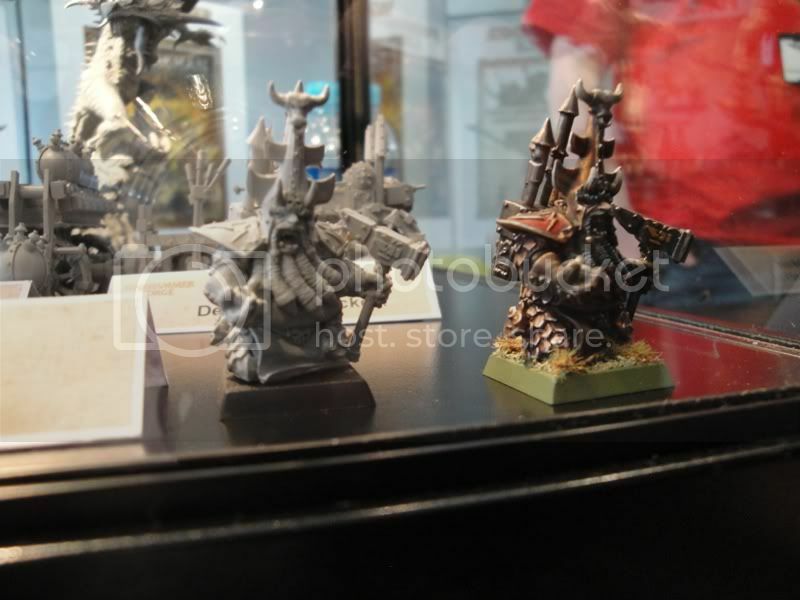 They can't start making FW versions of regular infantry units as that treads on the studios toes, so they intend to do upgrade kits to get around this. Things like Kislev, CD and hobgoblins would be treated as allied forces, not stand alone armies. Dogs of War may get some treatment, but only in the form of Regiment of Renown unit/command upgrades for warhammer army book units. Similar format to the imperial armour books; story line, characters, army lists, special rules and figures to go with. The books will NOT contain photographs of the models, they will only be artwork. 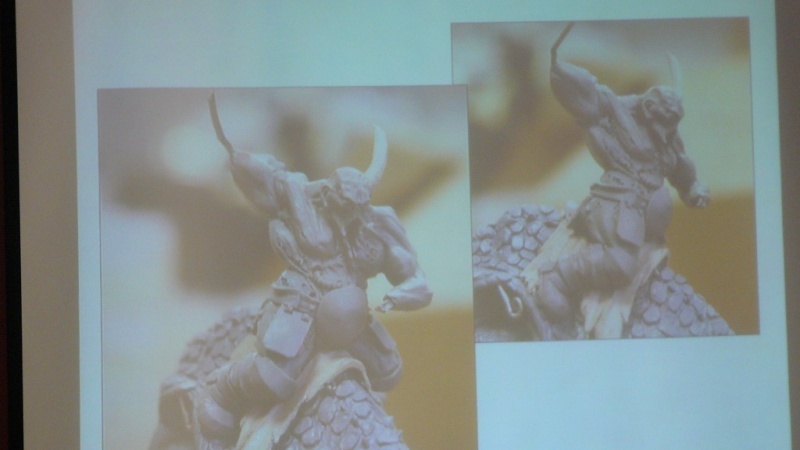 The idea is that the Warhammer Forge books will be of the "era" and be illustrated manuscripts. 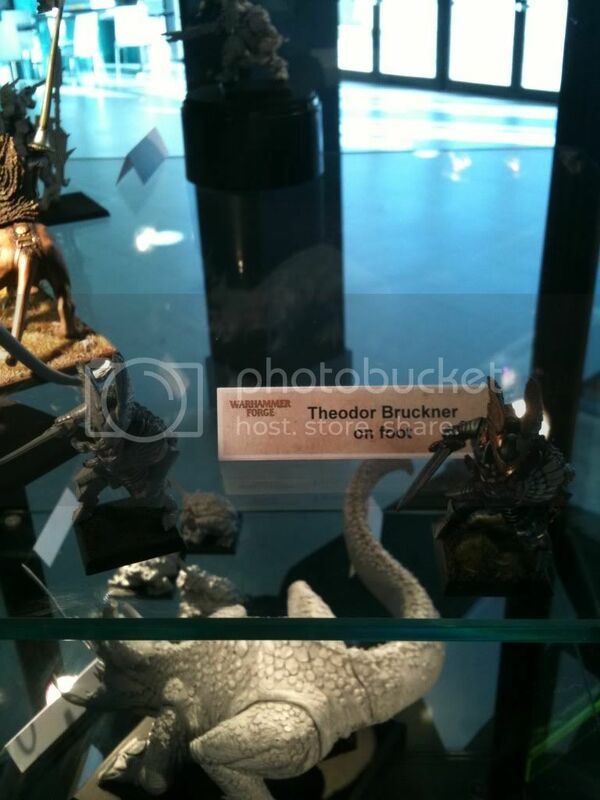 I guess it also allows them to release models for them years later, as they only have artwork as the placeholder. 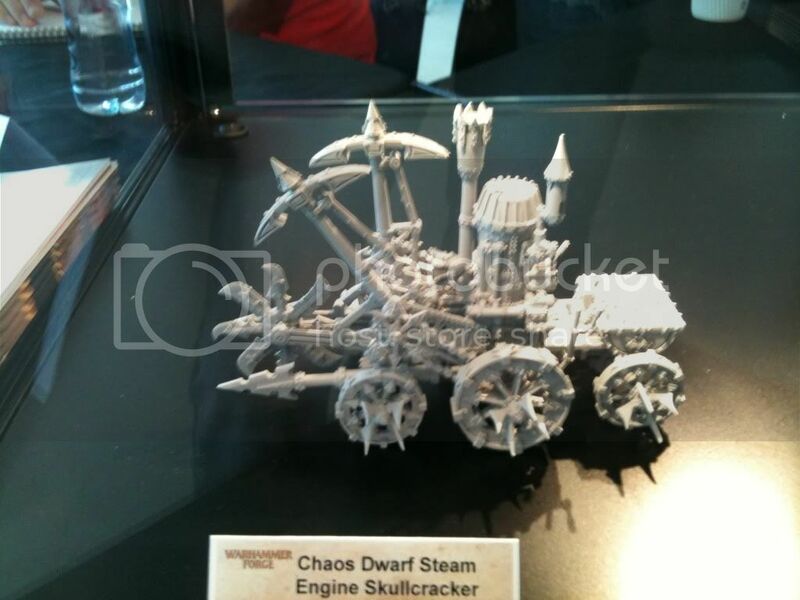 The Warhammer Forge books will be linked and span several volumes detailing an expansion of Chaos. This is not written as an unbroken narrative but rather as a selection of scenes or encounters, parts of the story which give the background for the battles. It will be spread over more than 40 chapters and follows the fortunes of the key characters. 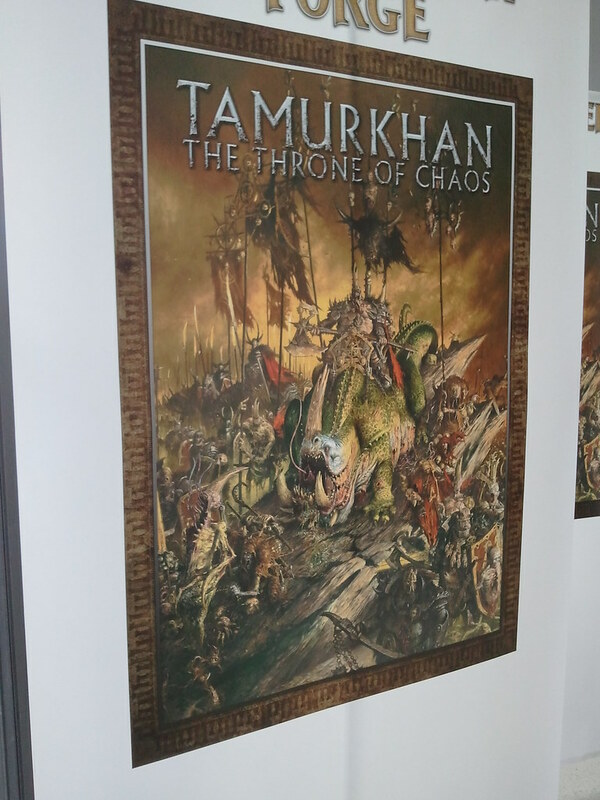 The first book follows the fortunes of Tamur Khan for a bit then leaves him hanging whilst following the fortunes of one of his lieutenants for example or spotlighting events elsewhere in the warhammer world which have a bearing on the tale, before returning to the main characters again. All sumptuously illustrated with fine artworks and wonderful maps showing the routes followed by the main protagonists so we can place the events in the warhammer world as the story unfolds. Rick has actually scaled out the WFB map in his own way to plan out how long it would actually take an army to march etc. Rick basically wants to muck around with the timeline and advance it in these books. 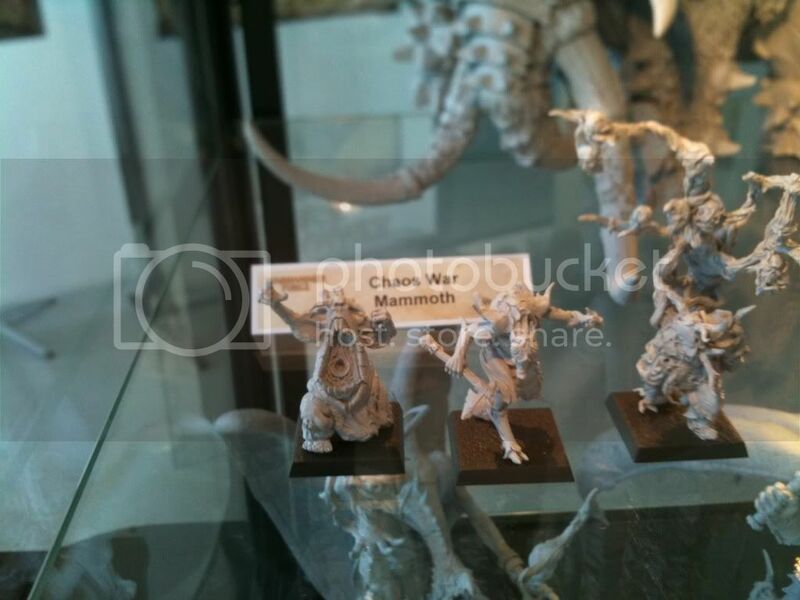 The first book features the expansion of Nurgle into the West; Nurgle WoC, Chaos Dwarfs, Ogre Kingdoms and Empire. 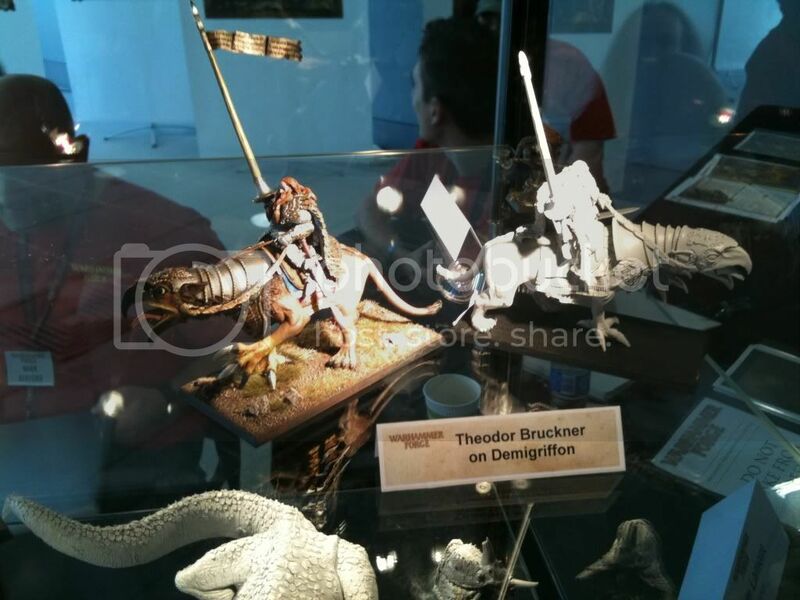 Second expansion is Tzeentch into the south, fighting the Lizardmen (presumably O&G as well). 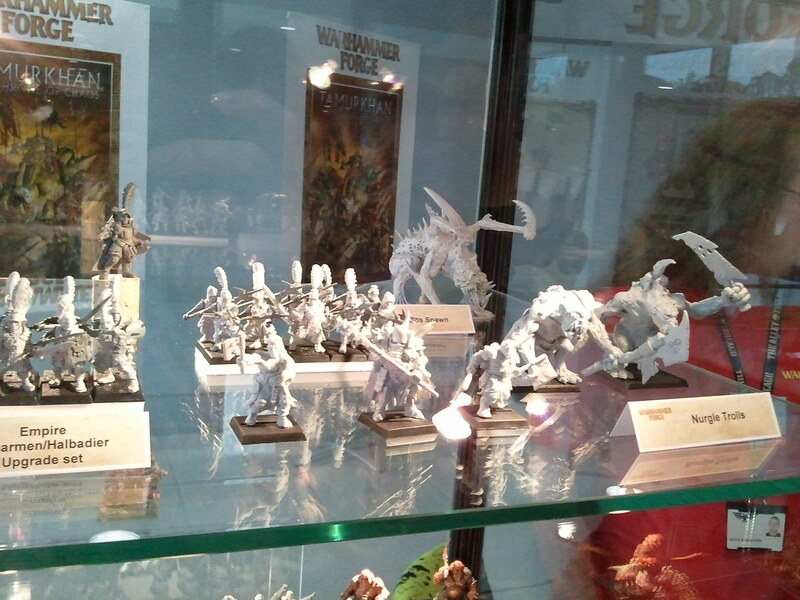 Third expansion is Slaanesh into the East, fighting ‘elves’ (presumably High Elves and Dark Elves). Forth expansion is Khorne into the North. 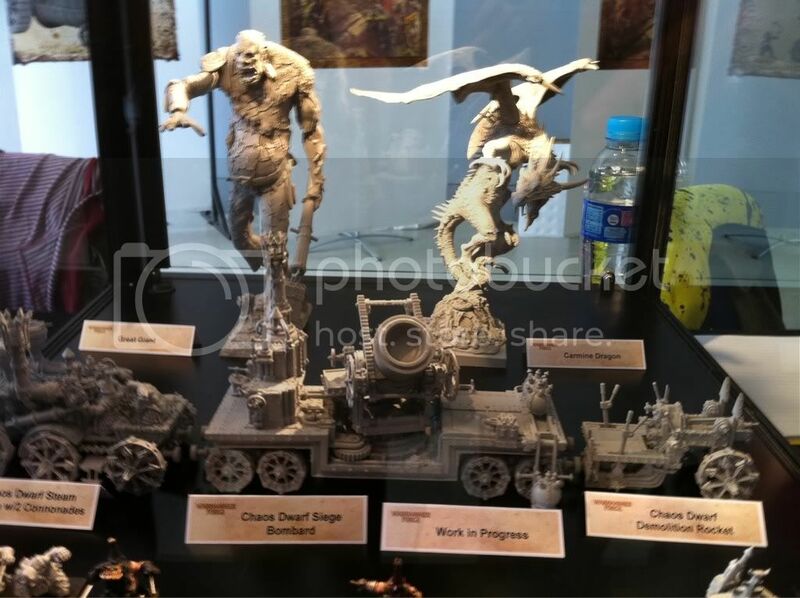 Note that there will probably be 2 books per chaos god, and there may not always be a book with chaos in, if there is something significant happening somewhere else in the world that has some bearing on the overall story. Planned and written by Rick Priestley. Lots of bespoke Adrian Smith artwork will feature in the first book. Harry thinks the first book gets as far as the sacking Altdorf. The first book either starts or ends with Karl Franz presumed dead along with all or most of the counts. Esme Stoutheart the Halfling becomes the emperor, this lasts for a short while. Karl Franz son was kidnapped by orcs and sold to chaos slavers, he's a dark sorcerer. 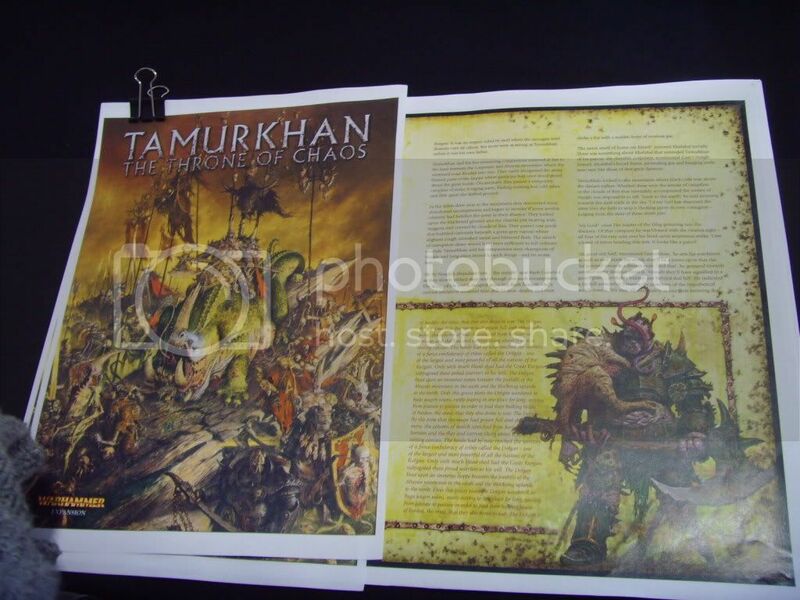 The first book Tamurkhan focuses on Tamur Khan (a Nurgle worshipping warlord) who is marching west through the lands of the Chaos Dwarfs and the Ogre Kingdoms. Finally ending up in the Empire. Tamur has taken the form of an Ogre as he takes on the form of whatever he kills, otherwise he is just a big maggot or a lot of small maggots which are release when he is wounded. The 4 brothers (major powers) divide the world into quarters, each heading in a different direction. 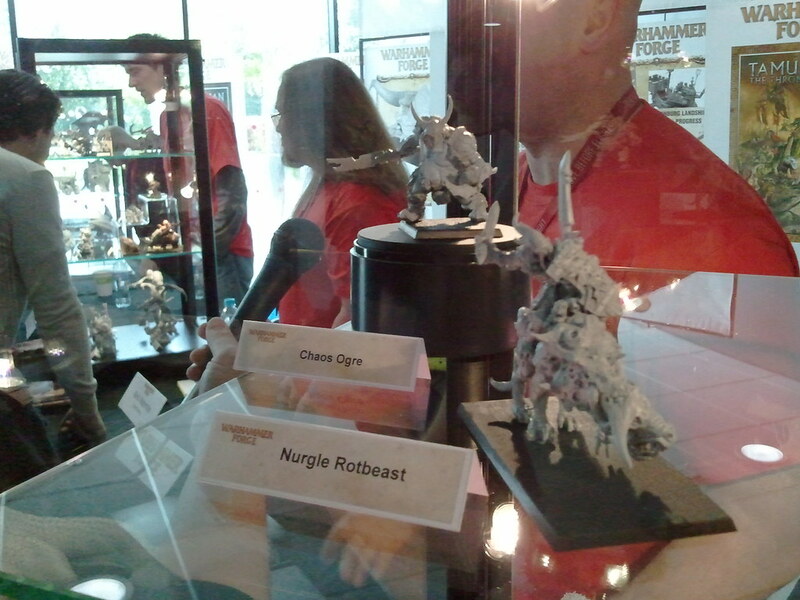 The Nurgle invasion starts just north of the mountains of mourn. Some ogres fight against chaos, some join chaos. They then move on through the steppes and dark lands, picking up chaos dwarf and hobgoblin allies and fight their way over the mountains and along the Reik towards Marienburg. 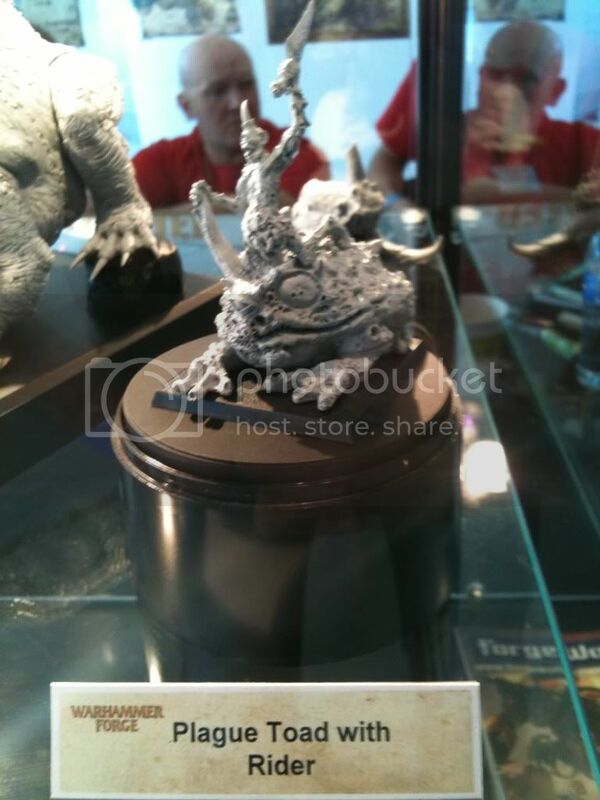 at some point the Nurgle lord bathes in the Reik and turns it to pus. 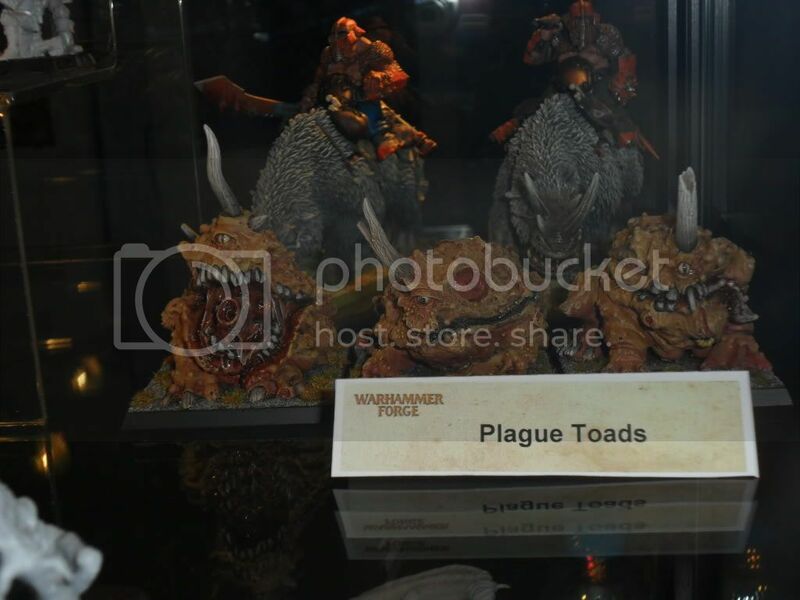 The plague toads are either daemons who have used the befouled Reik as a warp rift or possessed/mutated wildlife from the river.